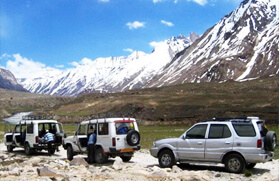 Covering the three different states of North India, Punjab, Himachal Pradesh and Jammu and Kashmir, the Amritsar- Srinagar jeep safari expedition gives the idea of elated thrill and adventure throughout the journey. The drive from Amritsar to Srinagar along Manali, Keylong, Kaza, Tabo and Kargil makes for one of the North India's best road trips. The road from Amritsar, taking in some of the Punjab, Himachal Pradesh, and Jammu and Kashmir, is a gem if you want to get away from the hustle-bustle of city life, pay a visit to best shrines in the world and of course, drive on the fantastic routes. Right from covering some of the sacred shines in India like Golden temples in Amritsar, monasteries in Kaza, Dharamshala, Keylong, Chandika Devi temple in Nako, Trilokinath temple in Mandi, to visiting the heart -wrenching places that fill your heart with the love for India like Wagah Border and Kargil, this trail takes you to the most dramatic and out of ordinary places of North India. 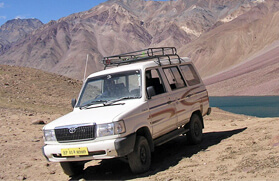 Beyond these locations, this safari jeep tour will also take you to Tirthan Valley in Kullu district, which is quite famed for its fishing and angling spots and Drass, one of the coldest regions in the world. And after taking you through a rocky ride to heaven, your journey will end at Srinagar but fortunately, you will take back so many memories that will blaze your memories long after leaving its mountains. Early morning, board a train to Amritsar. Claimed to be one of the oldest city in Punjab, Amritsar houses one of the most sacred sites of Sikhs, Golden Temple alias Harmandir Sahib (or Darbar Sahib). Upon arrival in Amritsar, you will be transferred to a hotel. Evenings will be free at leisure. You will be going for sightseeing to famous Golden Temple and Jalianwala Bagh. Dinner and overnight stay at Amritsar hotel. It's going to be a fun day as you will be indulging in some sightseeing in Amritsar. In the morning, after breakfast, you will be visiting Durgyana Temple and Mata Lal Mandir. Post lunch, you will be visiting Wagah Border, which is 30 km from Golden Temple, for the beating retreat ceremony, a military practice that the security forces of India (Border Security Force) and Pakistan (Pakistan Rangers) have jointly followed since 1959. Wagah is a village through the controversial Radcliffe Line was drawn in 1947. After attending the ceremony, drive back to the hotel in Amritsar. Dinner and overnight stay at Amritsar hotel. Dig up in early morning Punjabi style breakfast and get ready to roll on your first day of Jeep safari expedition. Today, you will be travelling to Dharamshala via Gurdaspur and Pathankot, approximately 205 km from Amritsar. During the journey, you will visit a temple near Batala. Sprawling farmlands will accompany you throughout the journey. After few kilometers, you will start noticing hills, which means that you have crossed Punjab and entered Himachal Pradesh. During your trip from Pathankot to Dharamshala, you will visit Trilokpur rock cut temple. From Dharamsala, we climb further 10 Kms to the Mc Leodganj, which is the house of His Holiness Dalai Lama, administration centre of Government of Tibet in exile, monasteries, and various other Tibetan centres. On this day, you will visit the residence of HH Dalai Lama and Namgyal Monastery. Enjoy a leisure walk on the roads of Mc Leodganj. Dinner and overnight stay at Dharamshala. Dig up in early morning breakfast and visit the attractions of Dharamshala like Tibetan Medical and Astro centre, Tibetan library, Tibetan Parliament in Exile, Tibetan Handicraft Centre, Tibetan Children Village, and Norbulinga Institute, where you will be enjoying your lunch. Post lunch, you will visit Lord Elgin's Memorial, St. John in the Wilderness. Dinner and overnight stay at Dharamsala. As you will start moving uphill, the thrill quotient eventually increases. Today, after breakfast, you will drive to Tirthan Valley in Kullu district, relatively an unexplored attraction in Himachal Pradesh. During the journey, you will be passing through the tea gardens of Palampur, and beautiful Lake of Mandi. In Mandi, you will also be visiting the temples of Trilokinath, an ancient shrine known for its sculptural artistry Idols of Narda and Sharda and many other Hindu gods. Further, a three-hour drive will take you to Tirthan Valley. A part of Great Himalayan National Park, the Tirthan Valley is a heaven for fishing and angling lovers as the icy cold water streams coming directly from Himalaya brings with them beautiful wilder brown trout and rainbow trout. In the evening, you will be transferred to a fishing resort at GHUSHENI for overnight stay and dinner. Begin your day with a smile and depart for the next destination Jalori Pass (3140 M) right after your breakfast. During today's expedition, you will be passing through Shoja, a tiny hilly hamlet in Seraj valley of Himachal Pradesh. The way towards Shoja goes through dense jungles of Alpine's trees, which offers an unharmed habitation of many kinds of fauna & flora. After crossing 35 km, you will see Jalori Pass top and from there you will drive downhill towards the Sutlej Valley. 86km downhill drive from Jalori Pass Top and few kilometers from Sutlej Valley; you will reach Rampur, a centre of silk trade route, situated on the bank of Sutlej River. From Rampur, we will drive further towards Sarahan for dinner and overnight camp. Early mooring, seek blessings of god at the Bhimakali Temple, which is located against the background of Mt. Shrikhand Mahadev (5227 m). The temple carries huge importance for Hindus as it is believed to be the place where Goddess Shakti destroyed King Bhasmasur. Along with the temple, you can visit the Pheasant Breading Centre and stadium. From Sarahan, you can also pick some apple. After this memorable morning, we continue our journey to the beautiful valley of Kinnaur. You will drive through the Sutlej river area where the major power projects are currently taking place. 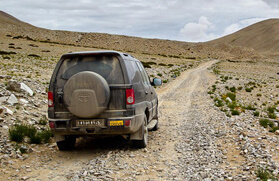 The excitement of the expedition reaches its peak when you will cross some curvy roads at Chora and Nigulsari. After driving for few kilometers, you will arrive Powari and thereupon drive further to Kalpa in Kinnaur via Reckong Peo. When in Kalpa, you can see the stunning view of mountains like Kinner Kailash range. Overnight stay at Kalpa hotel. Early morning, treat your eyes with a view of Kinner Kailash Peak. After breakfast, you will be visiting the Chandika Devi Temple at Kothi. With silver plated doors and wood carvings, Chandika Devi Temple is an important stopover point for people visiting Nako. Seek blessings of the goddess at the temples and then embark on an uphill drive to Nako via Reckong Peo, Pooh and Khab. A small village located at an elevation of 3662 meters, Nako is believed to be created when Lord Padamsambhava was explaining his disciples about a fairy tale. Overnight stay and dinner at Nako camp. Post breakfast; get ready for a 63 km long drive to Tabo via Maling Nallah and Sumdo, which is situated along the Spiti river bed. Some kilometers away from Nako, you will visit a village Tashigang. Around Tashigang, you will see many caves and waterfalls, which were the abode of many fairies. At Sumdo, you will have to take a permit so that you can visit the further area. After 100 kilometers strenuous drive from Tashigang, you will be reaching Tabo. Upon arrival in Tabo, you will be transferred to a hotel. In the second half of the day, you will visit the group of monasteries, which were believed to be found in 996AD. With its original decoration and art images intact, it is considered to be the oldest continuously functioning Buddhist monastery in India and the Himalayas and also known as Ajanta of Himalayas. Dinner and overnight stay at Tabo hotel. In the morning, you will be exploring the caves in Tabo, where once great sages used to pray. After breakfast, set forth on your journey to Pin Valley via Dhankar Monastery. The capital of Spiti Valley Kingdom during the 17th century, Dhankar was the seat of early rulers of Spiti, the Nonos, who had the right to cultivate the government lands nearby and were required to keep the fort in repair. Situated at 3,894 meters (12,774 feet) in the Spiti Valley between Tabo and Kaza, the complex is located on a 300 m long cliff, overlooking the confluence of Spiti and Pin Rivers. 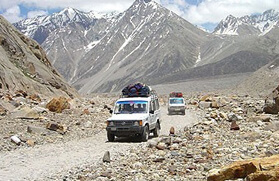 After spending some time at Dhankar Monastery, you will be going for a drive to Pin Valley via Kungri. After a visit to the monastery, we leave for a small drive to Mud, the last village of Pin Valley and from where trek routes to Kullu and Kinnaur commence reaching Pin Parvati and Bhaba Passes. After that, you will cross the river at Attargu and then drive 14 km to reach Lhalung Monastery in Lingti Valley. Dubbed as the Golden Temple by the people of the Buddhist community, Lhalung Monastery is one of the earliest monasteries founded in Spiti by the great Tibetan Buddhist lotswa (translator), Rinchen Zangpo, the king of western Himalayan Kingdom of Guge during the late 10th century CE. After paying a visit to the monastery, approach the main road to visit Kaza, which is 10 km from Lhalung Monastery. Evening and overnight stay at a hotel in Kaza. Post breakfast; embark on a drive to Kee Gompa, followed by a trip to Kibber Village, Hikkim, Langza, and Komic. 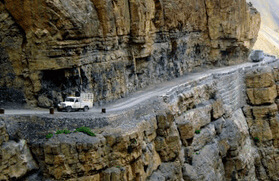 On this day, you will visit the biggest monastery of Spiti Valley, Kee Gompa, and Hikkim and Komic, highest villages of the world connected with the road. 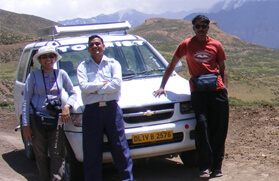 After spending a day with the ancient monasteries of Spiti valley, we will get back to Kaza hotel. Dinner and overnight stay at Kaza. Dig up in an early morning breakfast and embark on a drive to Keylong via Hansa, Losar, and Takche. The place Takche offers a panoramic view of the mountains and the different small wild flowers. 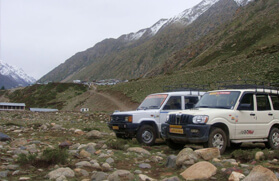 After few kilometers, we will start driving uphill to Kunzum Pass and after reaching a certain point, start descending to Batal, a place on the riverbed of Chandra. From Batal, start following the river for 36 km till you reach Chatru. 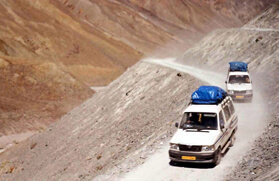 From Chatru, we again climb to Gramphu and then join the Manali- Leh highway to Keylong. Further, you will stop at Koksar for the tea and registration of passports and later reach Keylong through the various village of Lahaul Valley and the meeting point of Chandra and Bhaga rivers at Tandi. Dinner and overnight stay at Keylong. In the morning, you will start driving uphill to reach the Kardang Monastery. Built in the 12th century, Kardang Monastery houses a huge library where one can find many books related to Buddhist literature. After spending some time at the monastery drive downhill to reach Sarchu via Jispa and Darcha, two prominent bases for trekking to Zanskar since the ancient time. Another trip of 73 km will take you to Baralacha La (4830m). Further, a 33 Kms of a relatively rougher road will bring you to the busy little hamlet of Sarchu, which marks the border between the states of Himachal Pradesh and Jammu & Kashmir. Overnight at fixed camps. Post breakfast, jump into your jeep and embark on a drive to Leh. Initial 25 km, also known as Lingti Plains, will be smooth road and then you will pass 10 km nerve-wrenching 21 hairpin bends, which are also called the Gatta Loops. After some kilometers, you will reach Nakee-La (4800 m), a high mountain passed famed for offering a beautiful view of mountains. 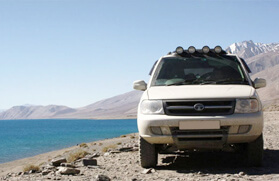 After crossing the pass, you will drive downhill to reach Whiskey Nallah, beyond which the road begins to climb to the Lachalung la Pass, which is exactly 54 km from Sarchu. Then you will pass through a vast expanse of a flat area called the Moray Plains which are a part of the Tibetan Plateau. The highest point of today's expedition will be Tanglang La (5359M), which is also the second highest motorable road in the world and also the last pass on Leh- Manali highway. Cross Tanglang La and you will enter a small village, sprinkled with green fields, which also marks that we have entered Leh. 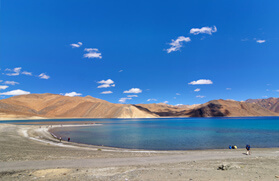 Today, you will explore the mountains to get a flavour of Ladakh's rich culture and heritage. You will be covering Thiksey, Shey, and Hemis monastery and also visit Sindhu Ghat, Shanti Stupa, Leh Palace and Namgyal Shemo Gompa. Dinner and overnight stay at Leh hotel. Post breakfast, drive towards Ulytopko and during the journey, you will visit the Phyang Gompa, around 6 km away from Leh. 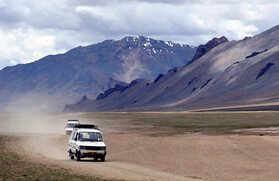 Further, we will drive to Likir, which is situated on the hill, to visit the Gompa. Also, you will be visiting Basgo, an ancient city that currently in ruins. Then, you will cross Indus River to reach Alchi to visit the monastery. Spend some time at the monastery and then embark on a trip to Ulytopko for overnight stay and dinner. Finally, the day has come for what we have waiting for, a spectacular drive from Ulytopko to Kargil. On your way, you will be visiting the Ridzong Gompa, which was the meditation centre of famed Buddhist saints. After visiting the monastery, we drive straight to Kargil over Fotu-La [3967 M] which is the highest pass on Srinagar - Leh road. Further, you will be driving up the Kangaroo curves. 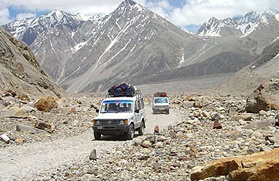 During the journey you can savour the fascinating view of granite color rocks, Mulbek & Namik-la (3697M) are other fascinating places on the way. The Chamba statue carved out of a single rock about 144 ft. high at Mulbek is worth seeing. 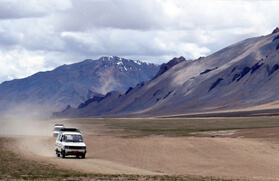 After a strenuous 193 km long drive from Ulytopko, you will reach Kargil, second largest urban centre of Ladakh. Numerous caravans carrying exotic merchandise comprising silk, brocade, carpets, felts, tea, poppy, ivory, etc. transited in the town on their way to and from China, Tibet, Yarkand and Kashmir. In the evening, you can explore Kargil. Dig up in early morning breakfast and start travelling to Drass, the second coldest inhabited place on earth from where you can see the spectacular view of peaks like Tiger Hill and Tololing Peak. After Drass, we will be passing through Zoji La (3033 M), which will make our way to Srinagar. During your journey to Srinagar, you will be passing through Sonmarg. On arrival in Srinagar, you will be transferred to a house boat for overnight stay and dinner. Begin your day with a hearty meal as today you will be going for a sightseeing tour to Srinagar and covering places like Shankaracharya Temple & Mughal Gardens, Nishat Bagh (Garden of Pleasure) & Shalimar Bagh (Garden of Pleasure). Further, you will embark on a drive to Gulmarg, a beautiful hill station famed for its meadow, golf course and world class ski resorts. After spending some time at Gulmarg, return to Srinagar. In the morning, you will be transferred to the airport. Thereupon, you can board a flight to Delhi.